To view all the available rewards, log in or create an account at www.idealdebitrewards.com and click "Rewards". Misplace your card? Get a replacement quickly and easily by calling (855) 341-7668. If you have a Gold or Platinum Debit Card, log in to your account at www.idealdebitrewards.com and click "Shop Online" and "Shop Online Settings". If you have a Gold or Platinum Debit Card, log in to your account at www.idealdebitrewards.com and click "Shop Online". 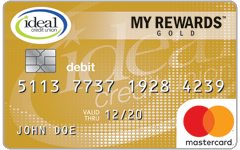 If you have a Gold or Platinum Debit Card, log in to your account at www.idealdebitrewards.com and click "My Rewards Card" and "My Area Deals". To request assistance, please call 855-341-7668. If you have a Gold or Platinum Debit Card, log in to your account at www.idealdebitrewards.com and click "My Rewards Card" and "Rx Savings"
To request assistance, please call (855) 341-7668. If you have a My Rewards Debit Card, sign in to your account at www.idealdebitrewards.com and click "My Rewards Card" and "Hotel/Car Discount Codes". If you have a Gold or Platinum Debit Card, log in to your account at www.idealdebitrewards.com and click "My Rewards Card" and Rx Savings"
Access to a convenient short-term loan is easier than ever! You may be eligible to have instant access to cash to help you manage unexpected expenses. There are no hidden fees and no down payment required. If you have a Platinum Debit Card, log in to your account at www.idealdebitrewards.com and click on "My Rewards Card" and "Loans". If you have a Gold or Platinum Debit Card, log in to your account at www.idealdebitrewards.com and click "Rewards". If you already have a www.idealdebitrewards.com account, please log in and select Card Settings from the My Rewards Card menu.